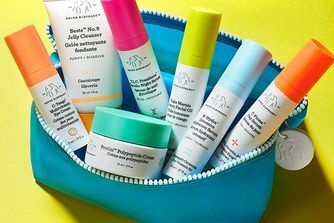 Probably the most wanted skin care range ever, Drunk Elephant is worth the hype – and then some... Founded by Tiffany Masterson, who wanted a clean break from toxins and the ‘Suspicious 6’ (essential oils, drying alcohols, silicones, chemical screens, fragrance/dyes and SLS) this brand has created a whole new category in the beauty space: ‘Clean-Clinical’. Jam-packed with incredible levels of amino acids, growth factors and signal peptides, this moisturiser melts right into skin to keep it hydrated, bouncy and balanced. This silky water-gel moisturiser is the perfect defence against the signs of ageing – think of Protini as a powerful shot of protein powder for your skin, which helps to maintain collagen, encouraging its production and preventing its breakdown. Formulated with a complex of 9 signal peptides, pygmy waterlily stem cell extract, soybean folic acid ferment extract and acetyl glutamine, Drunk Elephant has, with this moisturiser, designed a powerhouse product that revives depleted and tired skin to its former glory. Watch your as your complexion quickly becomes firmer, stronger and more hydrated. The airtight (and cute!) container also helps the formula to stay super-fresh. Apply morning and night to clean, dry skin. Very hydrating moisturiser, and it absorbs very quickly. Perfect for the day time. In the beginning, it feels heavy, but in the end, my skin feels so hydrated. Make up glides beautiful. Post pregnancy I had a lot of acne and pimple issue on my face. I shifted to DE products 2 years ago and I am very happy using it. It has helped me clear my skin, eliminate hyper-pigmentation and discolouration. It saves most of my skincare time as DE products can be mixed with each other and applied all at once! Currently I use no make up just clear glass skin! Thank you so much DE and thank you Cult Beauty for shipping to India. I first had a deluxe sample in one of the Christmas kits and was immediately impressed by how my skin felt and looked. It has a definite plumping and cushiony effect but was not at all greasy and sank in beautifully. It works really well for a cocktail base with the airless pump forming a well to add drops of other products to, one swipe and it's all in my hand, hygenic and the perfect amount every time. No breakouts and it lasted a solid 3 months which makes it really good value too. I'm on my second tub now and love it just as much as the first time I used it . I bought this after reading all the reviews. I'm always looking for cruelty free/vegan no nasties moisturizer. My skin is normal type. I used this exclusively for two months. So I could see what it does. It felt heavy on my skin but it did absorb eventually not right away. I have no idea why but I broke out in little water spots. No other creams have done this before. As soon as I stopped using it the water spots vanished. I don't know how to describe that. The texture of the cream the smell and packaging are great. But due to the above it's not something I could continue to use. This is hands down the best moisturizer I have tried. Have been using this cream about a month and very impressed with the softness of the skin of my neck and face when used in conjunction with the regular skin regimen. However, I have experienced some breakouts since I have been using it, where I was using an acne-specific moisturiser beforehand (The Blue Herbal Moisturizer from Kiehls). Lovely gel-cream consistency. Wanted to try a 'clean moisturiser' with peptides as I use a serum which is targeted at evening skin-tone rather than the extras (Caudalie Vinoperfect). Using for a few weeks and enjoy the application with no residue, the jar is genius much more hygienic than dipping your fingers in every-time. Would probably repurchase though a tad pricey. I'm a fan of this packaging. Incredibly easy and sanitary. The product is a very good consistency for combo skin especially. The ingredient does work subtly but surely. Fewer lines and wrinkles on my face. I do have acne prone skin and it hasn't broken me out which makes me very happy. A great cream with good moisturizing effect.The cream is very light, quickly absorbed and the skin becomes soft, silky, moisturized. I love the packaging and the doses dispenser. Globally, I think that even if the cream feels very hydrating at first, when applying, it doesn’t give as much hydration as I hoped for. But I will keep trying until it’s empty to see my skin texture. This moisturiser is awesome for combo and very sensitive skin. No silicone, no fragrance, not greasy at all, and efficient. The texture reminded me of a Nivea cream. I either layer it over the Juno face oil or mix the two. I'm so glad I decided to use Juno again along with this protini cream, these products gave my skin its glow back. I encountered no breakouts, though my skin usually reacts to everything, and I think my skin does look and feel more firm. I'm 27 but severe illness and medications have had a certain impact on the look of my skin and face. I feel much better about it when I'm using these efficient skincare products.I will buy again for sure. Probably my favourite in the range - a lovely cream that provides persistent hydration. A beautiful formulation, it is somehow both rich and light. You can feel it properly absorbing. I have tried this moisturizer for some time now. And it is very, very good. It sinks in your skin quickly and makes your skin feel very hydrated. It doesn’t leave a residue. So it’s perfect under make up. You only need a pea size of product. So a little goes a long way. 5 out of 5. Excellent moisturizer for day and night! The consistency is whipped and airy and moisturizes the skin really well without leaving any oily or heavy residue. Skin looks like skin. The ingredients are also hard working yet clean - one of the main reasons I like DE products. Keeps my skin hydrated all day and works great under makeup. Mix in with a couple of drops of facial oil at night for an even deeper moisturizing effect. Would definitely recommend. I tried the cream for the first time yesterday, before I went to bed. This is the only thing I used. I was AMAZED how good my skin looked in the morning! Even my dark circles around my eyes looked reduced. And I can finally say at 40+ that I woke up like this with flawless skin. After one use definitely worth the hype. Used the whole thing and still didn't get the hype. It's an ok moisturizer, didn't do anything justifying the price. For reference - oily congested skin. Sensitive combination skin here, 39 years old. This cream keeps every single promise it makes. It strengthens, it moisturises, it absorbs quickly (at least in my case, no shiny result at all), it is fragrance free, it contains ingredients way more effective than other more popular and more expensive creams. Excellent product, I will repurchase again and again! First of all the product packaging is great, the product it’s self is a nice consistency I use this for nighttime as I’m not 100% sure how it would wear during the day as I do wake up looking very bright and shiny (if you have oily skin this might not be the product for you) but if you have dry dehydrated skin like me it’s super hydrating and my skin looks amazing in the morning! This is the product I was most excited for after the DE UK launch. Unfortunately I was plainly - underwhelmed. Don’t get me wrong, it’s not a bad product. Is it a nice moisturiser? Yes. It‘s hydrating and it sits well under makeup. It‘s fine, however, at this price point I expect a little more than fine. If you have the budget and want a luxury moisturiser, go for it. However, there are equally good products for cheaper. I have normal to dry skin and this cream works wonderfully. As I turn 31 I started to see lines between my eyebrows and smile lines became more distinct. I was about to give up on a wrinkle free face and accept my faith until now. From the first use, Protini Polypeptide Cream hydrates my skin and reduces the lines to almost invisible. The cream has a light soft texture and absorbs quickly into the skin. Right now it’s still kind of warm during the day in the centre of Italy so I think I’ll need to add extra moisture when it gets colder. The pump container keeps everything clean and fresh which is a big plus. Overall I am extremely happy and will repurchase again. I bought this after reading the glowing reviews. I don't think it justifies the price. I have tried better moisturisers for less money. I use this cream for everything now and I mean EVERYTHING. I've tried it in the morning after cleansing, as a primer to my foundation, in the evening after removing my makeup, and during the day if I have nothing else on my face. My skin feels so clear and hydrated and plumb and soft, I've definitely found a new lifelong best friend. Gel-cream moisturisers are my absolute favourite, and this is by far one of the best I've tried. It leaves my skin feeling so hydrated without clogging my pores and causing texture - an issue I get with most moisturisers. Combined with the super-hygienic pump dispenser, this really is a winner - I can genuinely see it working for all skin types. Only slight downside to the packaging is not knowing when I am about to run out, but regardless of that I will definitely be repurchasing. Absolutely in love with this moisturiser! The texture is beautiful and absorbs into skin very quickly. Easy to apply make up afterwards and doesn't make me oily. I would say this is a great moisturiser for all skin types. The packing is awesome and I love the easy-to-use push down pump. The best moisturizer for my very sensitive, combination, acne-prone, and rosacea-prone skin.Doesn't cause acne and does a brilliant job with moisturizing the skin without making it oily. Nothing compares, will keep buying forever. I love this moisturizer to mix with the Drunk Elephant Lala Retro! It gives me such a smooth canvas - I will forever repurchase. I am 40+ years old and I have quite demanding skin (combination skin + rosacea). Therefore, I did not have miraculous expectations out of this cream. I've used this cream for one month and for now I am very satisfied. It moisturizes my skin very nicely without any breakouts. My skin is not irritated and it looks very healthy. This cream has a little bit strange oily scent. In my opinion, the price of this cream is too high for what you get out of it but all in all, the cream is good. I gave this cream to my mum as a present. She has dry and sensitive skin, so I thought this could work for her. However, she said it wasn't moisturizing enough, so I took it back in case it worked out for me. I have normal to dry skin that isn't particularly sensitive, so most creams work for me. However, I don't like the feeling of this cream on my face. It feels heavy and oily and like it just sits on top of my skin. Hard to describe the feeling, but it just doesn't sit well with me. That being said, I haven't had any breakouts nor did I notice any change from using my normal cream (Caudalie). Kind of underwhelming considering all the hype. I love this cream with all my heart! I wish the product was just a little bit cheaper, but I will repurchase it anyway because it is truly amazing. I have tried multiple moisturizers and this is definitely my favorite so far. The Lala retro is growing on me though I find that one a tiny bit too heavy for my preference. I have two DE products; this one and the Lala Retro. I have been waiting for these moisturizers my entire life. Very sensitive and acne prone, but dry, skin. Amazing combination, I know. For the first time in my adult life I feel like my skin is properly nourished and the ingredients work. Mind you, I am a skincare enthusiast; ten step Korean skincare was my jam. Now just a double cleanse, an exfoliator and during the day Protini. At night a mixture of both. Want to buy the C-Tango eye Cream now. I have just started using this in combination with the Sunday Riley UFO oil, so that might have a little bit of an impact on my opinion. While the oil definitely changed my skin for the better and cleared it up and smoothed it significantly, this is such a lovely moisturizer. I always have a huge problem with finding things that don't break me out, but this so nice for my combination/oily skin and it is much more hydrated, without breaking me out. Although it is a bit pricey, however I tend to use half a pump, so it will last quite some time. Not a fan at all. This made my facial hair grow like crazy! Shame because I rather liked how moisturising it was! I bought this to try out after Kathleen Lights raved about it. I have combination, sensitive, acne prone skin and a lot of moisturizers don't do anything or make things worse for me. But this thing is like magic. I used it a few times and suddenly noticed how smooth and soft my skin felt. Even my huge pores look smaller! Makeup goes on really well on top too. Its pretty amazing. I wish it wasn't as pricey as it as but it's so good that I'm happy to shell out the money. I bought this moisturizer after hearing about it from Stephanie Nicole and Wayne Goss! I like the clean ingredients and it does what it claims for me. A solid staple in my routine, can be a little but to heavy on the skin in the morning during summer on oily skin, but rest of the year and in the night time definitely a must for me. Don't wanna be without it! Very nice moisturizer. Absorb quickly, make up friendly. Good for normal combination type of skin. Amazing cream that can be used both in the evening and under make up. Very light texture, fast soak in, sometimes I put 2 layers because skin wants more moisture. Doesn't clog pores, which is very important, so I recommend it, and for sure I will buy it again! in the winter the skin around my nose and mouth becomes really sore, raised and flaky, none of which has happened so far this year since I've been using this. I was skeptical about spending the money, and I'm glad I did. It goes on beautifully, and a little goes a long way. My biggest issue with it is that I'm going to have to shell out for it again! Pretty pricey for an okay moisturiser, I used it for 4 nights in combination with Luna oil and unfortunately it broke me out. I took a pause, now retrying it, but still there is this sensation that it doesn't do much for my skin. I got this as a sample initially and it was around the time I was starting to have serious issues with my skin due to change in weather. I had major dry patches around my mouth and nose and in general, the quality was not great, I was also getting breakouts, I used this in conjunction with the Sturm mask thing which by the way is also fab! expensive though! And the mix of the 2 within days bought my skin back, then I just used this cream day and night and its the best!!!! my makeup goes on better, stays on better where before the cream I was using it would break up a lot around nose area and forehead, this has just really saved my skin, of course I may have to change again to something different when warm weather comes but I may not, for now though this is my holy grail and in my opinion worth the money. Bought this as soon as it hit your shop. Used it daily every since. Work friends commented on the freshness of my skin. Love the pot! It's quite a heavy cream but I like that. Makes my skin look and feel soft and healthy. It also goes on smoothly and does not leave that annoying tacky residue and the packaging is a plus. Would totally recommend for those with normal to drier skin types. I have oily skin and I use this at nighttime. I do wake up with a very oily face after this but after cleansing the skin is soft and nourished. I haven’t broken out and experienced no irritation. It is expensive so I would recommend this as a day cream for drier skin types. I didn't particularly like this product straight, it gave me a couple of pimples, but I've been mixing it with retinol and have really been enjoying the results. If you have acne prone skin and are concerned about aging, try mixing this with another one of your existing products to see how you fare. The perfect moisturiser for this transitional season, when I need something a little heavier as the weather gets colder. The consistency is lovely and absorbs quickly to give my skin a plumped up, fresh feeling. My skin feels hydrated through the whole day so my makeup sits better too! I REALLY wanted to love this and thought I would. But after 4 days of use, I broke out awfully. All over my cheeks. I waited a week and tried again but 4 more spots. Please be careful if you are acne prone. I haven’t broken out this bad in over a year. I love this. I use skincare at night (SPF in the day) this makes you skin look so much better. The instant feeling of hydration but the benefits over weeks are just amazing. I will continue to use. Without doubt. Usually prefer facial oils when it comes to moisturising my skin. 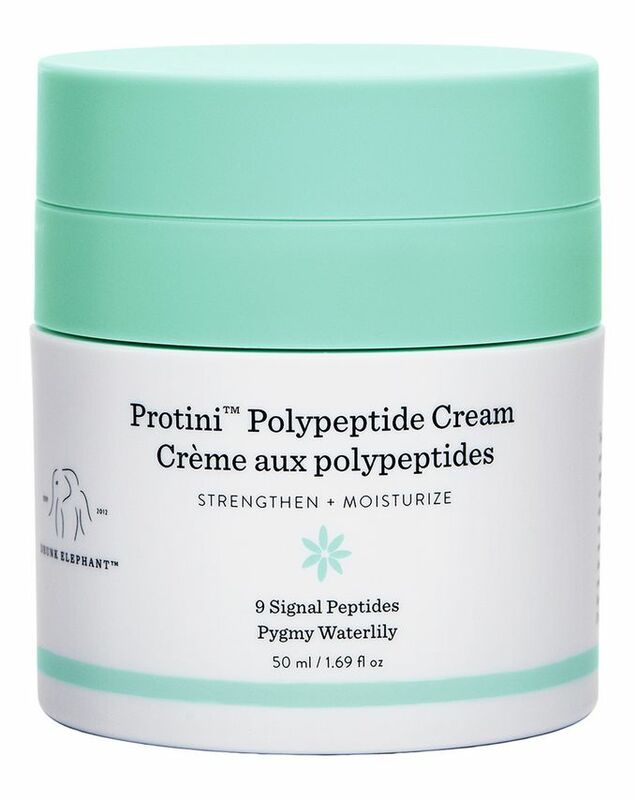 However, discovered Drunk Elephant and was recommended the Protini Polypeptide Cream! Absolutely love it, my skin feels immediately bouncier and hydrated. The cream is very lightweight and fresh. Will definitely be trying out more products from the brand!